Helicopters are always fun to watch flying in the air with their big fans rolling swiftly in air. Lots of people wish to sit in a helicopter and fly it in the air. But of course, this one is difficult in reality as everyone cannot handle a real glider or copter in air. Good news is that we are living in the 21st century and nothing is impossible in this tech age. Android devices specifically smartphones & tablets are very common these days and almost every other person has one. So you can play a helicopter simulation & battle hd games completely free and quench your thirst of flying a copter in air. 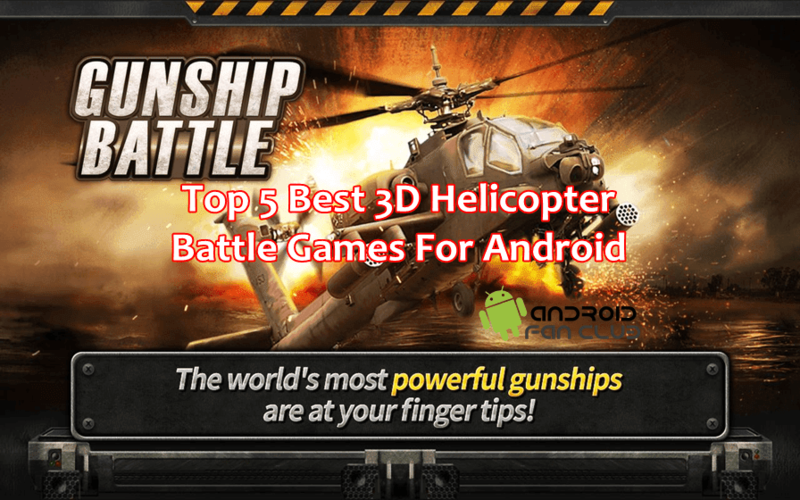 As the play store is loaded with a bundle of helicopter games which are almost all very attractive to play, here is my compiled list of top 5 helicopter games which you should play. Combat Helicopter Assault Operation (CHAOS) gives you a real time experience of being a helicopter pilot while being in a dogfight against an attack. The game has a number of great features on the basis of which it is selected as a number 1 helicopter game for android. The game has a realistic helicopter simulator, award winning visuals and sound effects, eight training missions etc. This game has got the number 2 spot on this list of top 5 helicopter games because of its popularity among game lovers. It is among top 10 most popular games on Google play as well. The game has 6 amazing worlds to explore with 90 exciting levels. The game is easy to use and addictive. Number 3 spot has won by gunship battle from JOYCITY Corporation. The game has currently 30 million downloads and a rating of 4.2 stars. The game is great as well as graphics are concerned. You have to choose from a wide range of helicopter gunships to play a mission. The chopper is equipped with a variety of weapons and gives you an enjoyable journey of 3D views. The games views are inspired by real life conflicts and missions. The game is a great option for you if you are a lover of shooting or racing games aside from simulation. The game allows you to control a real simulated little helicopter inside a house. The game is a 3D one in which you act as a pilot and controls a little copter. You have missiles or weapons to destroy the obstacles that come in your way in some missions. The game is developed by a single person and not by a company or professionals, however it is great. The game depicts a story of a policeman. You are acting as a policeman and have to fly a copter to catch criminals to save the day. The game is interesting and fun to play as there are 30 different levels and HD graphics. Helicopters are fun to fly and gunship helicopter shooting also provides great entertainment as well. If you have also played one of the helicopter gunship shooting games and want to share with us your views do comment below.